Since the dining room was removed, Annie and Ginny made sure the kitchen included enough seating for the entire family plus guests. Both sides of the island feature acrylic barstools—an easy-to-clean option for households with kids. 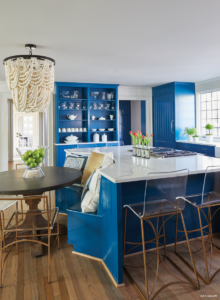 They also added a curved, built-in banquette, which provides plenty of seating around the kitchen table.While the statement-making chandelier adds a bit of glamour to the room, its painted wood beads maintain the farmhouse feel of the space. To make the house function for their family of five, Kaci and Wyman had to find a way to turn the three bedroom/two bath home into a five bedroom/four-and-a-half bath with a floor plan to fit the family’s active lifestyle. 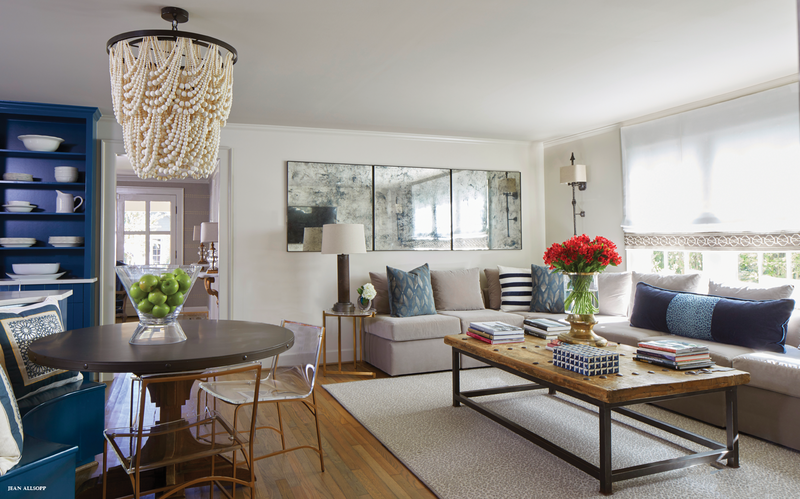 The Hamiltons worked with family friend and architect Matthew Costanzo to open up the space, creating a large kitchen and family room by removing walls and eliminating the dining room. They added square footage in the form of a much needed master bedroom suite and a large screened-in porch that doubles as a dining room for larger gatherings. Nothing adds a farmhouse feel to a kitchen like open shelving. 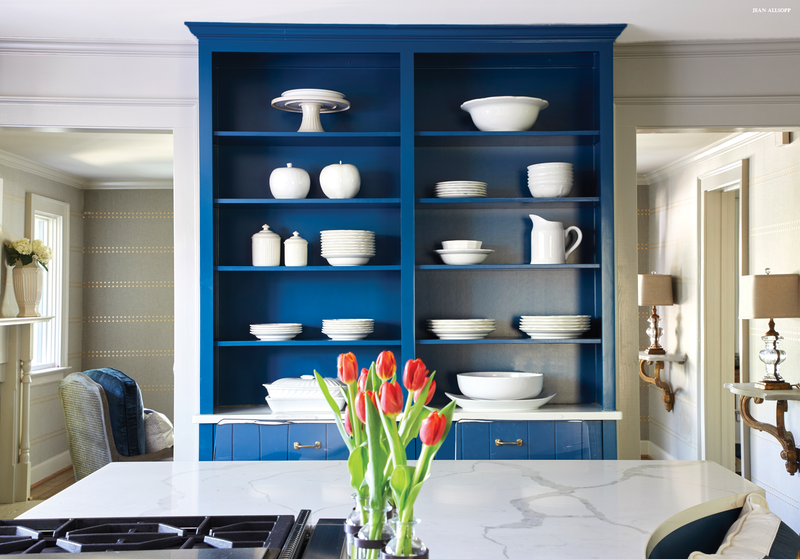 White china creates a nice contrast to the bright blue scheme. To keep the space open, Annie and Ginny went with a U-shaped couch in the family room. The couch takes up the entire back wall, but it maximizes the space. “Because the family room is open to the kitchen with the dining table in the center of the room, you don’t want to bring in too much furniture. Otherwise, it would overwhelm the space, ” says Annie. 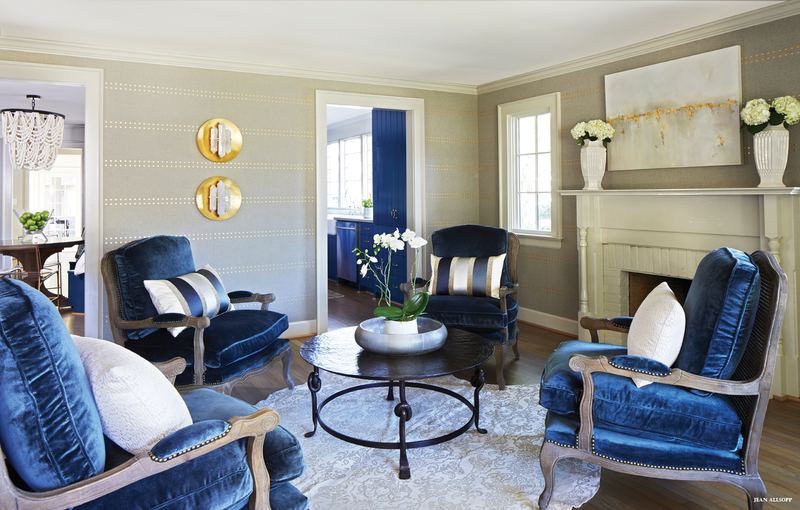 Annie and Ginny connected the formal living room to the rest of the house by incorporating plenty of blue and including touches of brass and iron. Unique statements come through with the textured Phillip Jeffries wall covering, patterned cowhide rug, and the brass and crystal sconces. “We decided to stack the sconces to create the look of sculptural art, ” says Ginny. The home’s entryway doesn’t have a defined foyer, so Annie and Ginny had wall-mounted tables designed to fit the small space. 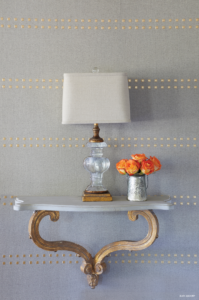 The tables have an antique look, creating a pleasing juxtaposition to the more modern feel of the wall covering. “The powder bath is the best place to really make a statement, ” says Annie. 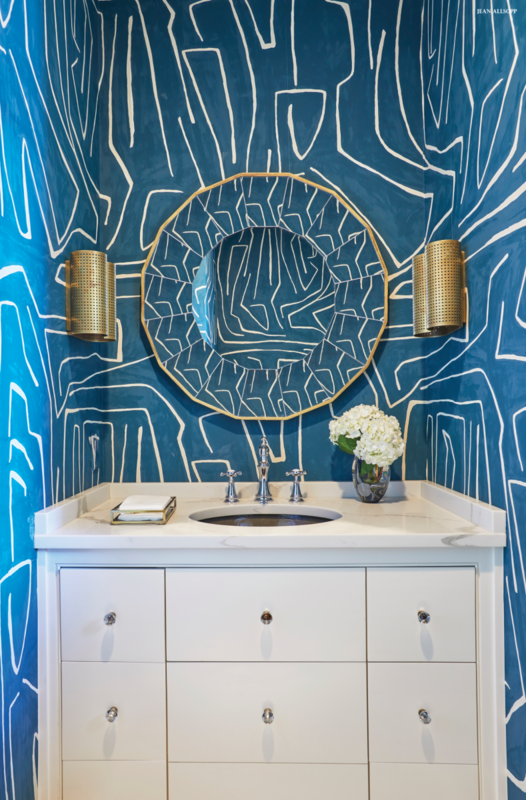 “It’s a small room that everybody sees.” Annie and Ginny created impact in the Hamiltons’ powder bath with a playful wall covering. 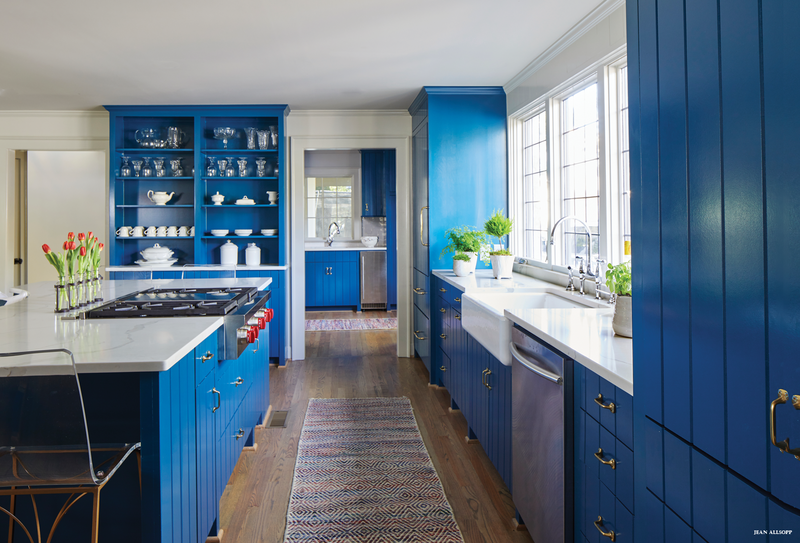 They kept the rest of the selections simple—such as the white cabinet and countertop and the glass ball cabinet pulls—so as not to compete with the pattern. Be thoughtful with every single detail. All of the elements should complement each other rather than fight with each other. “Sticking to the right shades of the color you’re using makes all the difference between creating a sophisticated environment and having a chaotic space, ” Annie says.